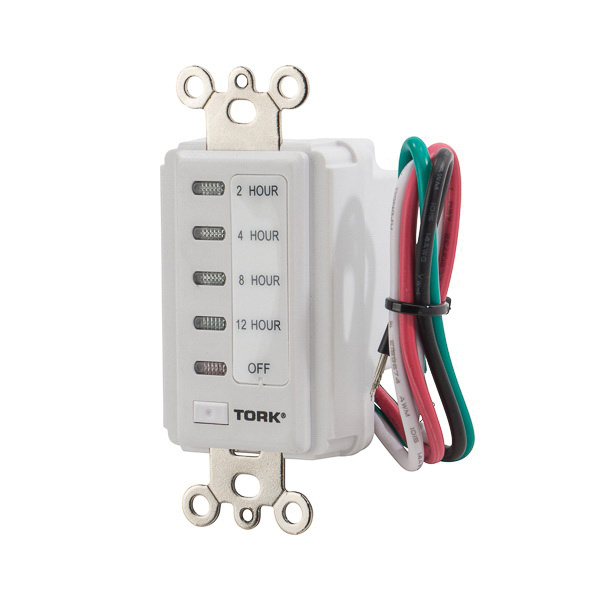 NSI Tork® D Series 1-Pole Wall switch timer with 2/4/8/12-hour timing, has voltage rating of 120-Volt AC and current rating of 15-Amps at 60-Hz. This switch timer has a dimension of 3-Inch x 5-Inch. It has contact rating of 15-Amps at 120-Volt AC for general purpose, 1000-Watts at 120-Volt AC for resistive and tungsten and 1000 VA at 120-Volt AC for ballast. This white colored switch timer comes with SPST contact configuration, LED display and offers electronic auto off action. It has maximum load rating of 1/4 hp at 120-Volt AC. In-wall/screw mountable switch timer supports conductor of size 14-AWG and has operating temperature rating of 32 to 122 deg F. It is great for whole house fans, indoor/outdoor lighting, bathroom fans and self storage control. Switch timer is cULus listed. * Inventory displayed is accurate as of 04/23/2019 19:40 EDT.